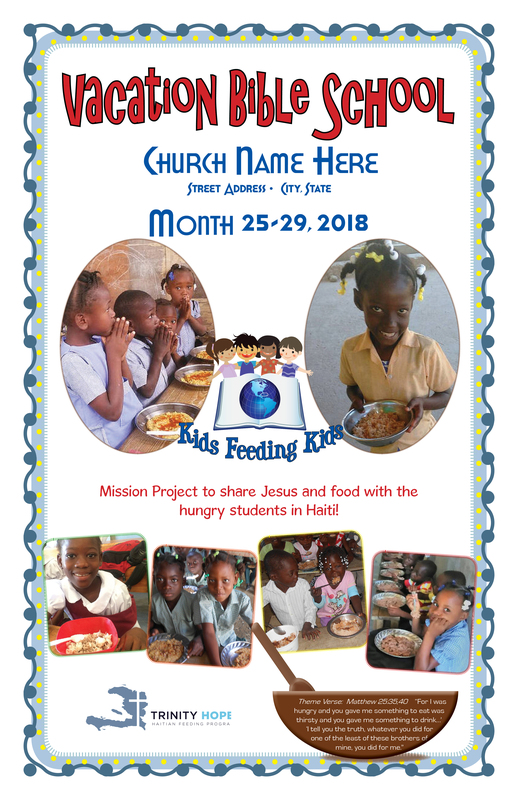 Trinity HOPE is a non-profit ministry that feeds thousands of hungry children, teachers and cooks each day in Christian schools spread throughout Haiti. They have a mission outreach program designed for children. It can be used for Mission time during VBS programs, Chapel, and Sunday School. Trinity HOPE had been using the original poster design for several years and wanted a fresh look. Some of their supporters use this program year after year and it was time to make the poster look exciting again. The redesign adds more color, movement and excitement to the overall feel of the poster that promotes the VBS program. More photos were also added into the design. These pictures are the students in Haiti that the VBS program helps. If you would like more information about Trinity HOPE, contact them on their website, www.trinityhope.org.